Last time i needed a table structure for groups and subgroups so i decided to create two tables and when i needed to query the groups from the database a i reminded myself about commont table expressions (cte) and the possibility to use them to query recursive data. So i looked at the msdn and found a good example. Nonetheless this is a good example i decided to post my own example too. First of all i will describe the two included tables. In the group table the name of the groups gets saved. The data in the table are parent and sub groups. Human is the parentgroup of child, juvenile and adult. Child is the parentgroup of baby and tottler. To reflect the hirachie of the groups i created the GroupsToGroups table. In this table the parent child relationship between groups is definied. 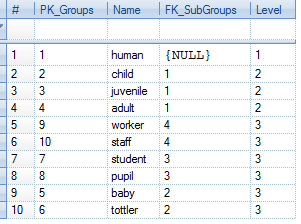 Child is the child of human so FK_Groups reflects the parent key and FK_SubGroups reflects the child key. So i need a function that returns a group with all the subgroups to check if a person is member of a specific group or subgroup. To reach this goal i am using a recursive common table expression. 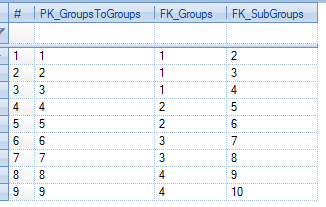 The GroupsFunc takes on parameter PK_Group and returns a list of the overtaken group plus all subgroups. The cte consists of two parts. The first part is the entry part, the second part is the recursive part. As you see in the second part the GroupsCte is used to join on the GroupsToGroups table. The recusion gets executed until the second query does not bring an result. If the query returns the result is feeded to the cte and so the next recursion step is executed. Here is the result of the executed GroupsFunc. After i finished the function with the common table expression i thought about a way to do this without a cte. Here is the result. It gives the same result as the GroupsFunc but i needet two functions and the outer apply keyword to realise this, and the resulting functions are much more complicated than the cte solution. The most imported point in the implementation is the recursive call of the function in the outer apply part. For every group in one hirachie the GroupFuncWithoutCte is called again and returns the child groups. If a group has no childs then the recusion ends. The starting point is the GroupsFuncWithoutCteMain function that queries the Group table and the calls the GroupsFuncWithoutCte function. it returns 6. That means that we split up the pass of the parameters. but in c# we need a extension method to curry a given function. //Currying a function with two parameters using anonyme methodes. //The method generates two nested anonymus methodes. //Func<T1, Func<T2, TResult>> is created. //and get back a Func<T2, TResult> func delegate. //so we can use it in the second call. //but it uses lambda expressions instead of anonym methodes. With this extension methodes it is easy to build a curried function. With the Uncarry extension method it is also possible to revoke the currying of a function. 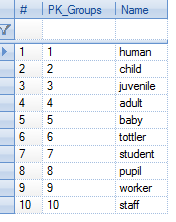 If you work with Sql Server and create a new table you often think about using the right primary key. In Sql Server, if you are using artificially primary keys you normally use an int key or and uniqueidentifier key. For performance reasons an int key (used with identity insert) is better, but you can not generate this key in the business logic. A uniqueidentifier can be generated in the business logic. But if you have a table with millions of enties and a uniqueidentifier primary key and you have lot of inserts in this table, then you could become a performance problem because after every insert the clusted index on the primary key has to be reordered. If you use newid() to generate the keys for the primary key, the generated key is not sequential and your inserts become slow. So since Sql server 2005 there is a possibility to generate sequential guids. With the newsequntialid() function the sql server generates sequential ids. But if you try invoke the NEWSEQUENTIALID() function in the sql server management studio, you get the following error. 'uniqueidentifier' in a CREATE TABLE or ALTER TABLE statement. This expression takes a new guid generated by the newid() function and takes the first 10 bytes and adds the 6 bytes from a datetime generated with getdate() to it. The cast to binary allows it to concenate the part of the guid with the datetime. So now we always get a new guid that is bigger than the guid generated before. This works because sql server orders guids in a very special way. If you want to know how, there is the blog that describes it. So at the database we now can generate a sequential guid and use it as default value in a tablecolumn or in stored procedure or function. But if we want to generate a sequential guid in the business logic we need the following class. As you see in the comments of the CreateSequentialGuid method first i calculate the base time i need. Sql server datetime type starts at 01-01-1900 and the .net DateTime type starts at 01-01-0001 so i had to bring both to the same base time. Then i had to shift the day value 4 bytes to the left and add the milliseconds (divided by 3.33333) to the value. The last step is to add the generated bytes to the correct position in the Guid. The following tests show how the generated Guids look like. So if you generate sequential guids this way you can gernerate the guid at the database and in the business logic, and you avoid big perfomance problems if you have multible inserts into tables with millions of rows and a uniqueidentifier primary key column. | doublevalue <= 10 && value >= 0 = "small"
| doublevalue <= 20 && value >= 0 = "middle"
| doublevalue <= 30 && value >= 0 = "big"
| otherwise = "not definied"
I think that guards could also be a practical construct in c#. Here is my implementation of a c# guard like construct. To see if it works i wrote some test cases. When(v => v < 10, v => 1). When(v => v == 50, v => 2). When(v => v > 100, v => 3). When(s => s == "not test", s => "not test"). When(s => s == "test", v => "test"). var doubleresult = i.Match().Where<int>(x => x * y). The Guards class is a generic class with two generic types. T is the type of the overtaken value and TResult is the result type. The When method is used to define the cases of the guard, the Default method defines the Default case. // when the Guard method is called all stored cases are evaluated and the result is calculated. // then the default pattern is called. The GuardExtensions class definies the Match method that generates a GuardContext object and overtakes the value the Guard should evaluate. The GuardContext class defines the connection between the overtaken value that comes from the Match extension method and the Guards object. // and is the starting point for the chain of Guards that evaluates the value. // result type of the chaining Methodes. It is the connection between the overtaken value and the Guards object. // and the Guards object is returned. // stored in the patterns collection (now the Guard object has two pattern entries). // the when method generates a Guards object and overtakes the value to this Guards object. So my self defined Guard in c# is not so beautiful as in haskell or f# but it served its purpose.